Munchkin develops innovative, modern, and credible products for babies and children that make parents’ lives easier and more enjoyable by thinking of "the little things." Getting a young child into their car seat or stroller can be a battle on its own. Digging for buckles and untwisting straps is an unnecessary hardship. As a new parent I am always open to new gadgets that promise even the slightest opportunity to improve the situation (and our daily life!). I have been presented the chance to test such a product, the Brica®Car Seat Buckle Magnets by Munchkin. The Brica®Car Seat Buckle Magnets by Munchkin are designed to hold buckles out of the way for easy ins and outs, and help prevent twisted straps. The product consists of 2 magnetic medallions that are secured to the car seat or stroller via a secure safety pin concept. At first, I was nervous about a pin being so close to my baby, however the pin is secured with a safety tab that is more sophisticated then the basic safety pin we all know. I am confident, for the time and age range I will be using this product, that this safety tab is sufficient. The product is easy to install and comes with a detailed instruction manual. The hardest part is deciding if it should go on the car seat, the buggy, or buy one for each. I do not recommend continuously moving the product as it does leave little pinholes in the material. Before installing this product, we struggled with twisted straps almost every time we used our car seat. We no longer have this issue with this product installed. 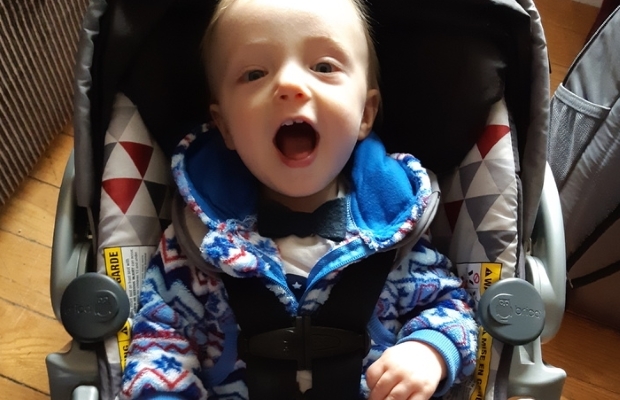 Even though my son continues to fight it when he’s placed in his car seat, I am able to complete the task of buckling him in quicker thanks to the Brica®Car Seat Buckle Magnets by Munchkin. Keep in mind it is magnetically operated, therefore it requires a metal buckle to connect to. I did not consider this and of course my buckles are completely plastic. I remedied the situation by purchasing small magnets from a local craft store and attaching them to my buckles. Out of curiosity I compared my car seat with those at my mommy-and-me class, and I was the only one with plastic buckles. It’s an unfortunate oversight but I didn't let that stop me from reaping the benefits of this product. 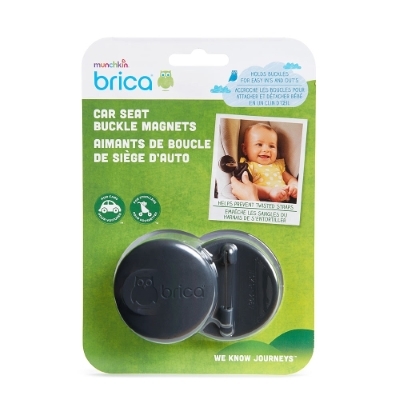 I do hope Munchkin will integrate a possible magnetic attachment to accompany the Brica®Car Seat Buckle Magnets so that even those whom have plastic buckles can use this product. This is a small, simple product that makes a tedious task quicker and less stressful. All in all, given this products design, implication, and now tested functionality I can say with confidence that I will be recommending it to my friends and family as a must have item for all car seats and strollers. "My milk supply has always been mediocre. There is the one side that has always been an over-achiever and the other one could hardly keep up with the demand of my baby. 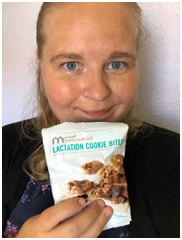 When the chance arose for me to test Munchkin Lactation Cookies I jumped on it instantly. Having great experiences with the Munchkin brand overall, I was cautiously optimistic. The cookies come in individual pouches and have a fairly generous amount in each pouch. I’m not going to lie, I was a bit hesitant before the first bite. These are lactation cookies after all. To say I was blown away by the taste is an understatement. The cookies taste like homemade chocolate chip oatmeal cookies and are super scrumptious. The pouch is just enough to enjoy with your coffee in the afternoon or to have in the diaper bag if you need something quick and filling for in-between. I personally take them anywhere with me now, just in case. After eating the cookies one pouch once a day for a couple of days, I noticed an increase in my milk production. My under-achiever actually kept up with the other side and I was able to pump and freeze some excess milk, which is a huge plus in my book. Not only are the cookies tasty, they are effective as well. 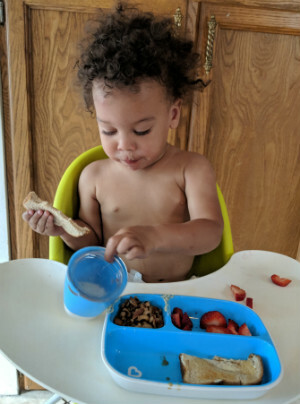 Munchkin Lactation Cookies receive two thumbs up from me, plus two thumbs up from my baby, who is happy about the extra milk." "I received these delightful little oatmeal chocolate chip cookie bites to review. While I am neither a chocolate lover, nor a breastfeeding Mum I was immediately pleased to read the list of natural ingredients on the box. 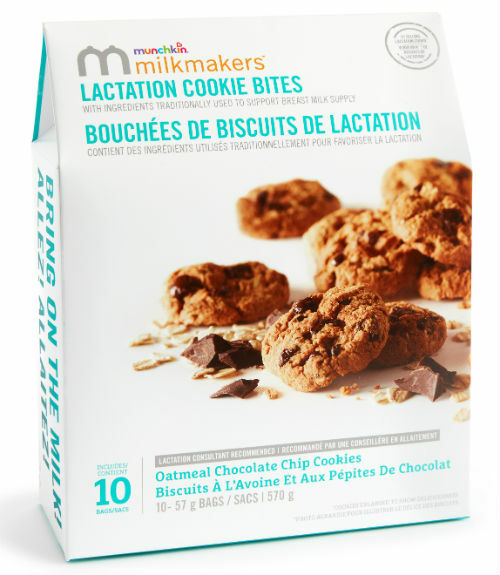 As a Lactation Consultant, I am impressed with the thoughtful packaging of convenient, individual bags of cookies that new Mums can carry with them on-the-go.They are packed with all the delicious and natural ingredients we LC's routinely recommend for supporting and increasing Mothers’ milk supply such as oats, flax seeds and brewer’s yeast. These sweet bites are yummy and crunchy and sure to please." 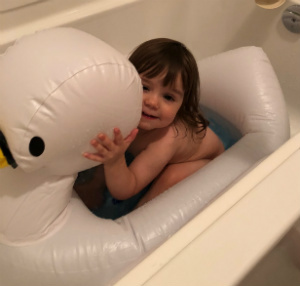 This inflatable swan is the perfect bath time accessory. It's adorable, for starters, and wee ones will love the idea of having a friend for the water. The temperature gauge is also easy to see, which is key for parents preparing baths. This bath time pal takes a few minutes to blow up, but once it's inflated it's the perfect addition to your child's routine. The bottom is textured to avoid slipping on the tub's surface, the headrest is padded for extra comfort, and it comes with a suction cup for easy drying. Knowing the temperature of the water is also so reassuring, especially for new moms and dads, and the bath has a built-in drain to remove the danger of standing water immediately. No more cumbersome bath time gear required once this swan arrives on the scene. The safety features are great, and it inflates and deflates easily for travel. Whether you're using this with a six-month-old who has just graduated out of the baby bath, or a two-year-old who is transitioning to the full-size tub, it's a great way to make bath time more fun for everyone. These dishes are so cute! The bright colours and streamlined, clean designs make them appealing to all kiddos. Munchkin has carefully designed these items with kids in mind. From the durable construction and gripping capability on the bottom of each item (to help keep dinner on the high chair! ), to the divided plates that keep food separate, these products work. They are also top-shelf dishwasher safe, which saves Mom and Dad time on cleanup. The whole line is a fantastic addition to any family kitchen, but the cup is genius for toddlers. The two-piece design is simple to use and to clean--no need to fiddle with separate parts to make the cup work. Check out Munchkin's full line of baby plates, dishes and bowl sets. "The Munchkin Safety Swan was a huge hit in our house at bath time! Though Noelle is at the top of the age range for this product, it was still nice to create a smaller space for her to sit, where I felt confident that she wasn’t going to slip and bonk her head. Using less water was also a great bonus. The biggest challenge was inflating this swan -- it requires a lot of air. But after seeing Noelle hug it and dance around asking to go in the “gucky,” it sure seemed worth it!" 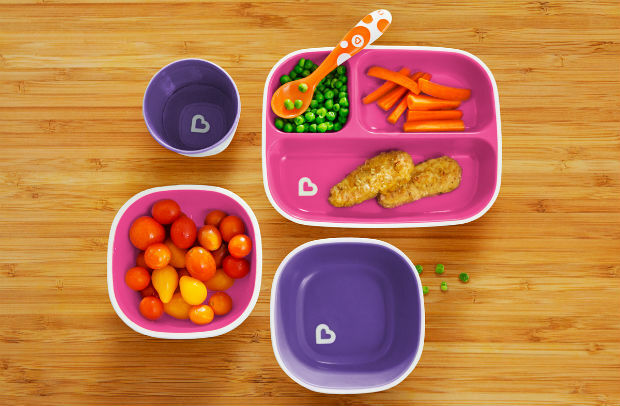 "Absolutely love the look and feel of the Splash toddler divided plates, plates, bowls and cups. The training lids didn't quite stay on -- but Indiana is pretty much intent on covering the entirety of the kitchen (including himself) with food and drink. We've broken every sippy cup we've owned but these ones withstood him throwing them across the room. The Splash line is cute and durable, and we would definitely order more (next time we'd add pink and purple to the mix!)." All for one, one for all. Munchkin's SnackCatch & Sip™ combination cup may just be your toddler's new favorite way to snack. The colours are bright and has a fresh updated look. The combination of the silicone straw and screw-on lid's tight seal prevents leaks and spills. The cup can hold up to 9oz. of milk, juice or water. Plus, this cup has convenient handles to make it easy for even the smallest hands to hold.! The lid of this straw cup has a snack catcher built into the top and can hold up to 4oz. of your tot's favorite treat. Fitted with soft flaps, it makes snacks easy to access, but not spill out. Miracles do happen. It’s hard to choose from the 4 beautiful colours, so why not get them all! The heart design is so cute and makes it easy for little hands to hold. the Miracle® 360° Cup eliminates messes and supports kids' dental health all at once. Drinking from anywhere around the rim, like a regular cup, helps support normal muscle development in a child’s mouth. And with no extra spouts, straws or pieces, the Miracle® 360° Cup is easy to use and even easier to clean. This new 14oz Miracle® 360° Cup even has a built-in silicone grip, so it’s easy for little hands to hold! We'll say cheers to that! Let's face it: toddlers are a messy bunch, even once they've learned how to drink and hold a cup. Now imagine a world in which drinks didn't spill at all — not in your diaper bag, not on your nightstand, and not on your growing toddler. No, it's not a miracle, exactly — it's Munchkin's Miracle® 360° Cup in a larger 14oz size. 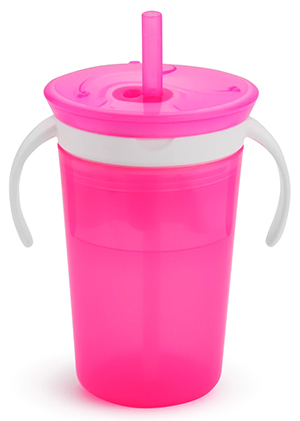 The first sippy cup invented with both parents and kids in mind. Chic babyproofing sounds like an oxymoron, but now there’s a baby gate with sleek styling to appeal to your modern aesthetic. Meet the loft aluminum gate by munchkin, a contemporary option that offers the ultimate in safety gate technology while pleasing the most discerning eye. The loft is smartly designed with safety features that adapt to your home’s specific needs. 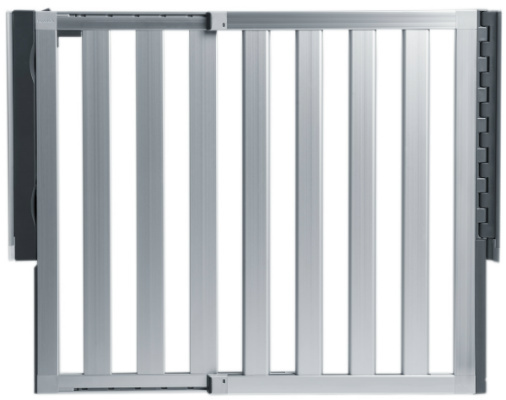 This is an aluminum hardware-mounted gate. Although you might be tempted to show off this head-turning gate to family and friends, quick release fittings allow it to be removed and replaced quickly when needed for high-traffic times or entertaining. Ideal for use in doorways, stairways, and halls, this sophisticated infant gate stands 30.5-inch Tall and fits openings 26.5-inch -40-Inch wide. Door swings open in both directions and a double-locking locking system on the handle is easy for adults, but difficult for children to use. To ensure a custom fit, this child gate can be “tuned” to accommodate any uneven surfaces in your home via the integrated tuning system. The indexed sizing system (ISS) allows the gate to be retracted or extended to achieve a perfect fit across a variety of width openings. Travel made easy "breeze"-y! The Clear-Sight™ mirror offers superior reflection and a distortion-free image, making it easy to always see your little one in the back seat. The Breeze™ will really blow you away! The Breeze™ Mirror has two fan speeds and is adjustable, so you can tilt it towards baby for the perfect angle. Plus, the fan features an auto shut-off which turns the fan off after approximately 10 minutes of use. 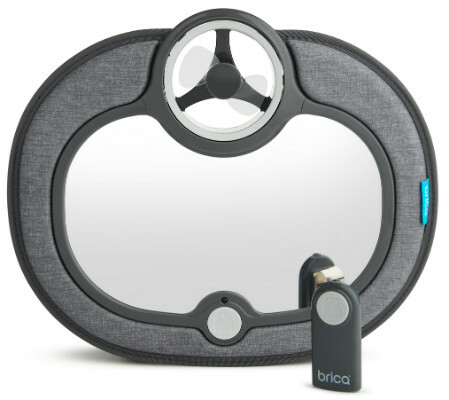 This crash-tested car mirror has a soft touch frame that is lightweight and energy-absorbing. Hot temperatures aren't fun for anyone, especially when you're in the car. We know as a concerned parent you always want to ensure baby isn't overheating. This is why Munchkin designed a new mirror with a remote-controlled fan. 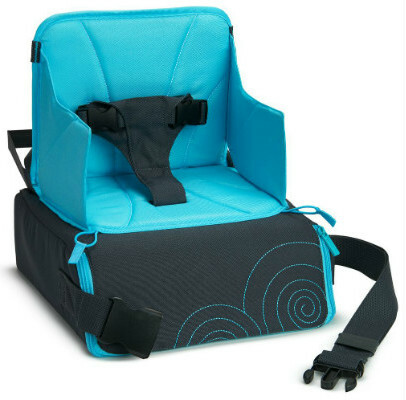 The Brica® GoBoost™ Travel Booster Seat is exactly what parents need for on-the-go dining. It’s so stylish and great for traveling. Love the built-in storage for bottles, diapers and more. I should mention that it’s easy to clean material is great. This stylish travel booster seat is stable and secure with a strong internal frame accommodating a toddler or child up to 50 pounds. The Xtra-Grip™ traction pads provide for a no-slip grip on chairs increasing stability and it has an adjustable 3-point harness system to accommodate children from 12-36 months. When mealtime is over, the GoBoost™ folds neatly and includes a convenient carrying strap. Rub a dub, dub it’s a swan tub! This is such a cute addition and love the white swan design with the big yellow beak….so cute. 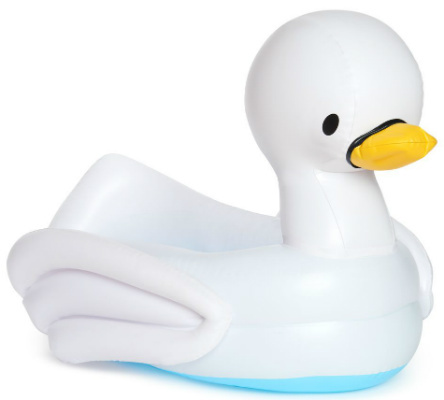 Munchkin’s Inflatable swan-shaped tub is ideal for babies who can sit upright (6-24 months). It has a textured, non-slip surface which helps keep the tub secure, and the convenient inflatable design is padded, creating a safe and comfy environment for baby to splash around in. There’s a drain so you can empty the bath easily without any heavy lifting. And because this swan-shaped bathtub deflates and folds compact, it’s perfect for use as a travel tub, too! The Built-in White Hot® technology tells you when the water is too hot for baby’s sensitive skin.